If you do SEO or SEM at a serious level you will, at some point, have a need to add a new tag or tracking code to a client’s website. Sadly, sometimes your priority list and the client’s developers aren’t exactly in alignment. Even if you have carte blanche access to the website to add or update any tags or code you want, all that code is cumbersome and hard to manage. This is where Google Tag Manager comes into play. 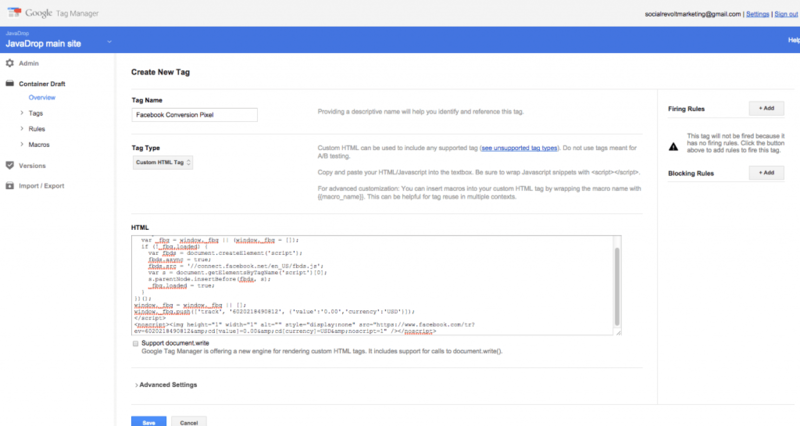 Google Tag Manager is a free tool that lets you add and update website tags like your conversion tracking, analytics, remarketing, or pretty much any other form of tracking you need as a marketer—all without having to update your site’s code every time. 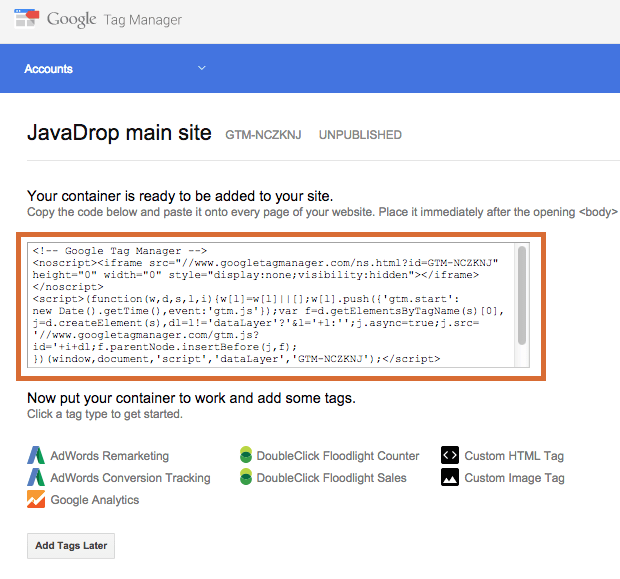 Google Tag Manager works by letting you install a single snippet of code, called a container, on your website. 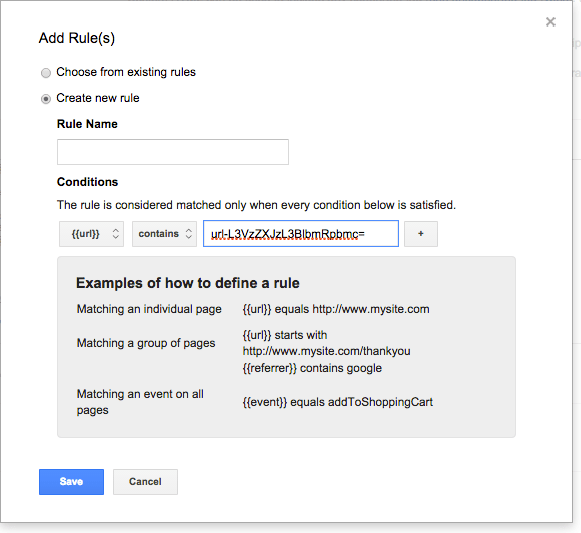 From the Google Tag Manager interface, you are able to add tags and site rules that determine when those tags fire. 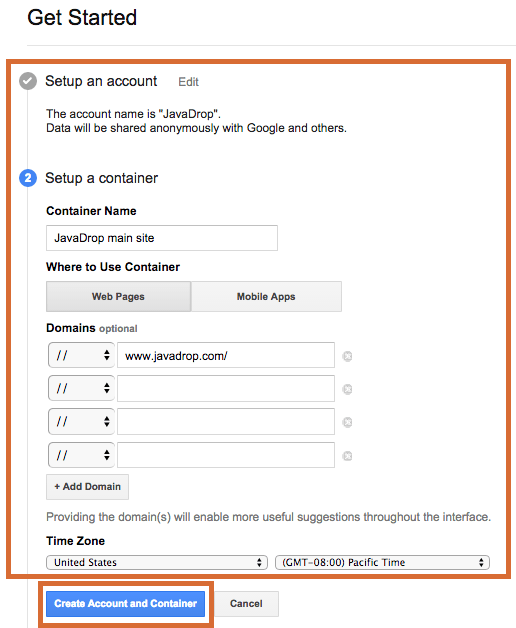 Setting up a container and installing it on a website takes about the same time as installing Google Analytics. Since almost anyone I work with will have at least nine tags installed on their website, I require a new client to set up and install Google Tag Manager before I start working. Once you’re logged into your account you’ll need to make a container to hold your tags. Click, “New Container” and fill out your info. Google will now give you a magical code snippet to add to your website’s header or footer. If you’re using a CMS you can add it to almost any file that is loaded throughout your website. With many premium WordPress themes, you will have a place to add code without editing theme files. However, if I have to edit code, I tend to use the footer.php and place the code in the section. Before you start adding tags let’s add a user. Click “New” and click, “User.” Even with all the great things about Google Tag Manager, my favorite is they way it handles users. I want my clients to own all their data, analytics, ad words, Facebook, etc… Anything I do as a consultant is using their accounts. They are giving me access–never the other way around. I would go so far as to say that any agency that is running your campaigns from their accounts, and sharing data with you, is not worth hiring. But that is a different post altogether. With your users added and the code in your site, you’re ready to add your tags. From inside the container click, “NEW->TAG”. From there, fill in the details. In the example below, I’m adding a Facebook conversion pixel to a client’s website. To add Facebook conversion tracking I’m choosing custom HTML as my tag type and copping and pasting the code from Facebook. On the right-hand side, there’s a box for, “FIRING RULES.” As mentioned at the top, these allow you to set where tags will appear and how they will fire. After you’ve added your tags, click, “CREATE VERSION,” in the top right corner. This will store the last revision for you. From there, you can preview your changes, and publish the current container. You’ll have to publish your changes, so they appear live on your website. Now that your container is published, your tags are live and firing on your site! If you manually added any of these tracking codes before, you have to remove them to keep them from firing twice and making your data unusable. 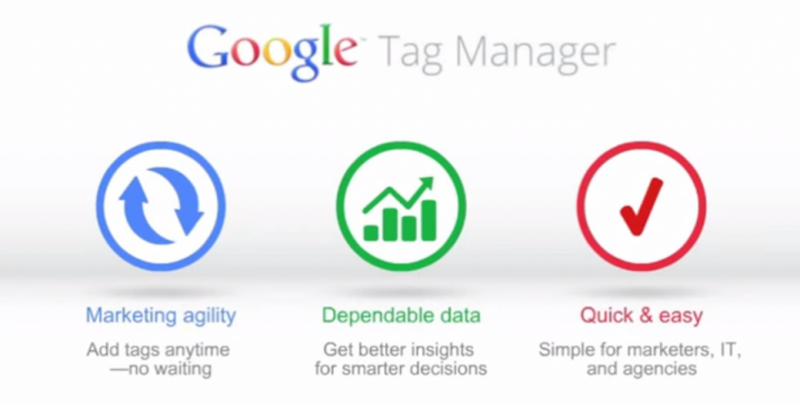 So readers how are you using Google’s free tool for better tag management? Mason Pelt is the founder and managing partner of Push ROI. Push ROI is a digital marketing and virtual reality video production agency.